Smart AdServer’s holistic yield management allowed Régie E-Commerce site Rue Du Commerce to increase its revenue. Read the BPA-certified case study below. You’ll find even more information about our solution in the AdExchanger article, “Rue Du Commerce Lets Direct And Programmatic Compete“. Download the PDF “Holistic Yield Impact Assessment: Régie E-Commerce (REC)“. Régie E-Commerce (REC) has 14.3 million unique visitors per month and is one of the top 12 online advertising networks in France. It reaches 48% of online shoppers in the country and counts among its publishers e-commerce leaders such as Darty, Rue du Commerce (which merged with Carrefour Online in 2016), Auchan, and Conforama. 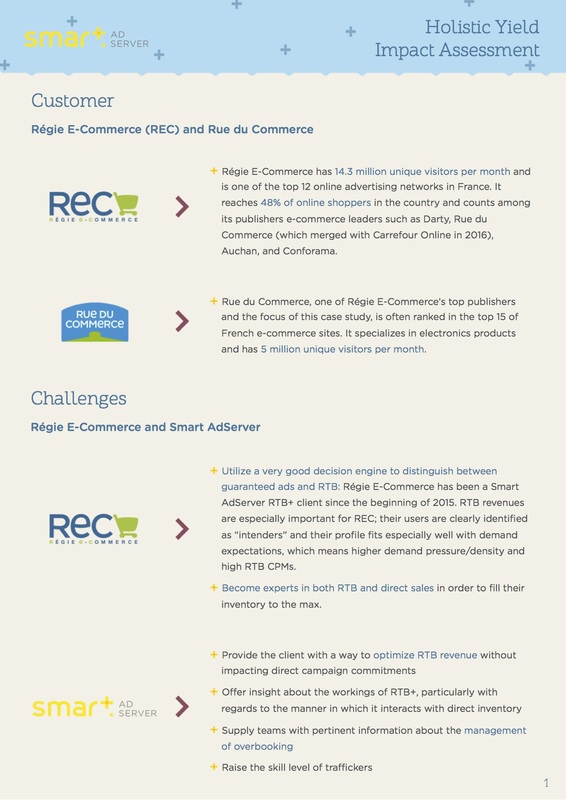 Rue du Commerce, one of Régie E-Commerce’s top publishers and the focus of this case study, is often ranked in the top 15 of French e-commerce sites. It specializes in electronics products and has 5 million unique visitors per month. -Utilize a very good decision engine to distinguish between guaranteed ads and RTB: Régie E-Commerce has been a Smart AdServer RTB+ client since the beginning of 2015. RTB revenues are especially important for REC; their users are clearly identified as “intenders” and their profile fits especially well with demand expectations, which means higher demand pressure/density and high RTB CPMs. -Become experts in both RTB and direct sales in order to fill their inventory to the max. Holistic yield management, which is only possible using an integrated RTB and ad serving platform, drives higher revenues than a traditional ad server and external SSP set-up. 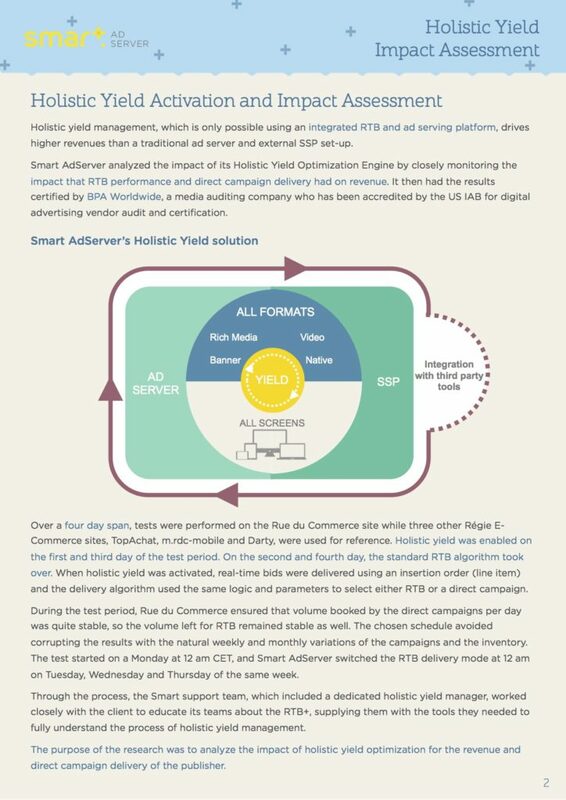 Smart AdServer analyzed the impact of its Holistic Yield Optimization Engine by closely monitoring the impact that RTB performance and direct campaign delivery had on revenue. It then had the results certified by BPA Worldwide, a media auditing company who has been accredited by the US IAB for digital advertising vendor audit and certification. Over a four-day span, tests were performed on the Rue du Commerce site while three other Régie E- Commerce sites, TopAchat, m.rdc-mobile and Darty, were used for reference. Holistic yield was enabled on the first and third day of the test period. On the second and fourth day, the standard RTB algorithm took over. 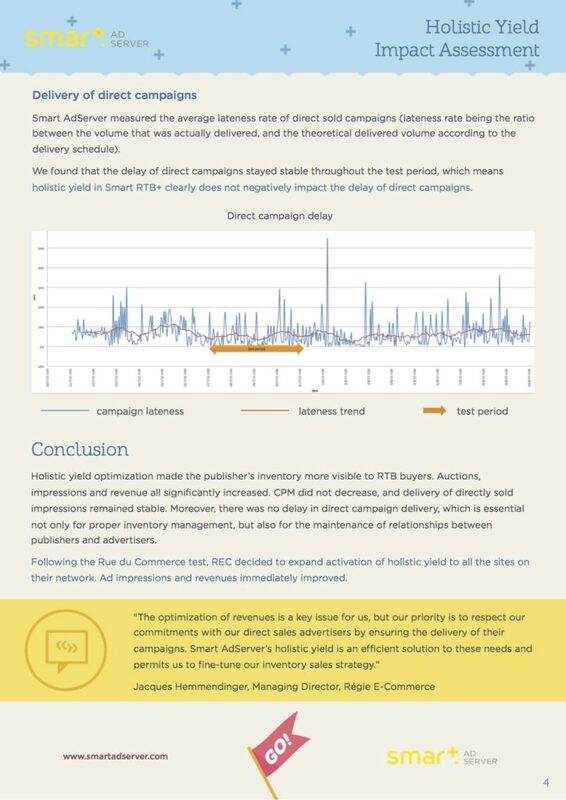 When holistic yield was activated, real-time bids were delivered using an insertion order (line item) and the delivery algorithm used the same logic and parameters to select either RTB or a direct campaign. During the test period, Rue du Commerce ensured that volume booked by the direct campaigns per day was quite stable, so the volume left for RTB remained stable as well. The chosen schedule avoided corrupting the results with the natural weekly and monthly variations of the campaigns and the inventory. The test started on a Monday at 12 am CET, and Smart AdServer switched the RTB delivery mode at 12 am on Tuesday, Wednesday and Thursday of the same week. Through the process, the Smart support team, which included a dedicated holistic yield manager, worked closely with the client to educate its teams about the RTB+, supplying them with the tools they needed to fully understand the process of holistic yield management. The purpose of the research was to analyze the impact of holistic yield optimization for the revenue and direct campaign delivery of the publisher. 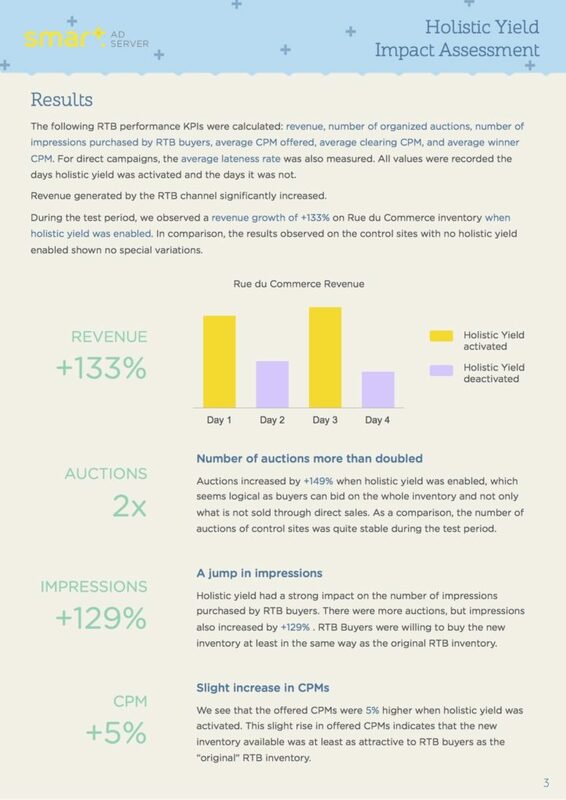 The following RTB performance KPIs were calculated: revenue, number of organized auctions, number of impressions purchased by RTB buyers, average CPM offered, average clearing CPM, and average winner CPM. For direct campaigns, the average lateness rate was also measured. All values were recorded the days holistic yield was activated and the days it was not. Revenue generated by the RTB channel significantly increased. During the test period, we observed a revenue growth of +133% on Rue du Commerce inventory when holistic yield was enabled. In comparison, the results observed on the control sites with no holistic yield enabled shown no special variations. Auctions increased by +149% when holistic yield was enabled, which seems logical as buyers can bid on the whole inventory and not only what is not sold through direct sales. As a comparison, the number of auctions of control sites was quite stable during the test period. Holistic yield had a strong impact on the number of impressions purchased by RTB buyers. There were more auctions, but impressions also increased by +129% . RTB Buyers were willing to buy the new inventory at least in the same way as the original RTB inventory. We see that the offered CPMs were 5% higher when holistic yield was activated. This slight rise in offered CPMs indicates that the new inventory available was at least as attractive to RTB buyers as the “original” RTB inventory. Smart AdServer measured the average lateness rate of direct sold campaigns (lateness rate being the ratio between the volume that was actually delivered, and the theoretical delivered volume according to the delivery schedule). We found that the delay of direct campaigns stayed stable throughout the test period, which means holistic yield in Smart RTB+ clearly does not negatively impact the delay of direct campaigns. Holistic yield optimization made the publisher’s inventory more visible to RTB buyers. Auctions, impressions, and revenue all significantly increased. CPM did not decrease, and delivery of directly sold impressions remained stable. Moreover, there was no delay in direct campaign delivery, which is essential not only for proper inventory management but also for the maintenance of relationships between publishers and advertisers. Following the Rue du Commerce test, REC decided to expand activation of holistic yield to all the sites on their network. Ad impressions and revenues immediately improved.